Deliciously sweet, savory and smoky! Perfect for lunch or as a starter for dinner, either you’ve found a new favorite. For dressing: in a bowl of food processor fitted with a steel blade combine vinegar, honey, onion, and oil and process for about 30 seconds or until smooth. Stir in oregano and season with salt and pepper. Meanwhile, preheat oven to 350 F. Lay bacon rashers on cooling rack set over baking sheet. Bake until crisp about 15 to 20 minutes, then set on paper towel to drain. Crumble or chop bacon once cooled. To serve. 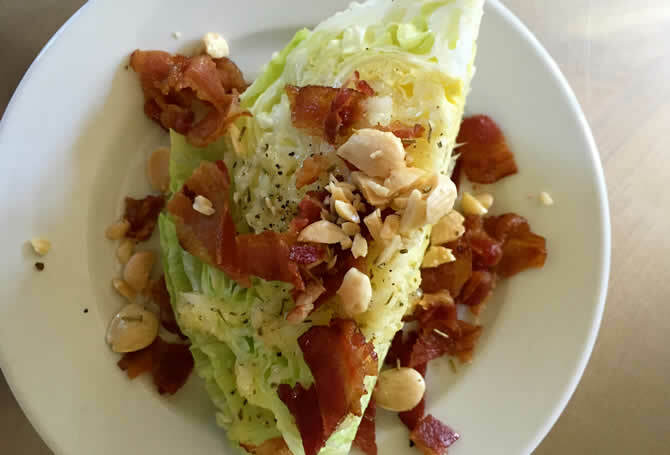 Set wedge of chilled lettuce on plate, top with dressing and plenty of bacon and almonds.